In Baseball > Signed Baseballs > Show & Tell and Baseball > Nolan Ryan Memorabilia > Show & Tell. My father and I personally got this ball signed by the greatest pitcher in modern history at a Texas Rangers game in the early 1990s. Not much else to say about it, except that this one is very special to me. Thank you VikingFan82, pwsest1944, kerry10456 and collecting! Thank you Cassata for the very nice comment! 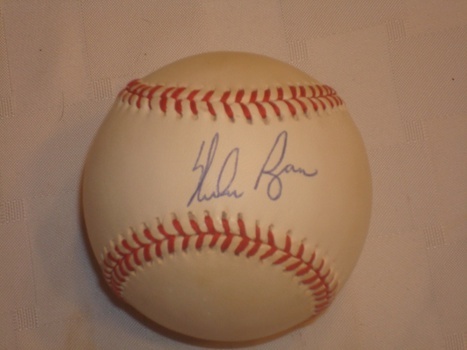 We had a Tona LaRussa ball that he signed for us, but we gave it to an elderly Cardinal fan in the nursing home. She kept it by here TV and didnt miss a game! No that he's retired I kinda wish I had it back! Nolan was something else. I remember seeing him pitch. What a fastball! I agree earlycoke, it was sickening to watch the Rangers lose Game 6, and then Game 7 was just ugly... But, very nice of you to give the LaRussa ball to the elderly fan. Even though he retired lol! Watching Nolan Ryan pitch was like nothing else. I was just a kid when his career was nearing it's end and when he pitched for Texas, but Nolan Ryan is really the reason I'm a baseball fan and a Rangers fan. Talk about an exciting player to watch! Thank you for the loves collecting and trgrubaugh! Thanks for the love mammi! Thanks for the love tom61375 and chevy59!